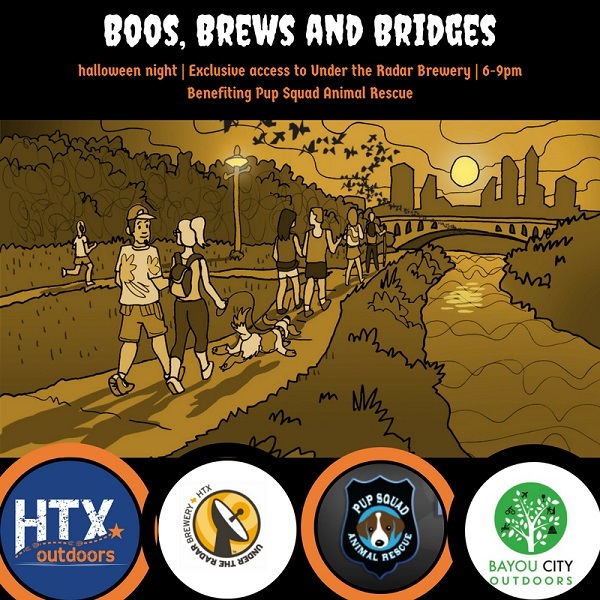 Join BCO & HTXO this Halloween as we get our slither on for a haunted walk followed by some boss brews for those who make it back from the haunted Houston bridges. Go all out on your costume or come sans costume and straight from work (that’s scary enough). You will want to have comfortable shoes to walk in. Under the Radar Brewery will open exclusively for our BCO & HTXO party this evening. We’ll plan to Leave Under the Radar Brewery at 6:45 and we'll return about 7:45. We’ll be tiptoeing across the glowing black and orange bridges of the Montrose District on this eerie evening. This is a dog-friendly event and dogs are allowed on the walk (about 2 miles). Plus, feel free to embarrass Fido and dress him/her up in costume. Pup Squad Animal Rescue will be joining us for the event. You’ll have a chance to say hi, get your photo taken, help an animal in need or just give a dog a bone (leg bones preferred).